TUI fly Netherlands has released some rare global promotional sale from Amsterdam to many tropical destinations. Do not miss this deal and book discounted flights to Africa (Cape Verde, Gambia) available from €162. You can also visit various destinations in the Caribbean Sea such as Cuba, Dominican Republic, Jamaica, Cancun or ABC Islands. (Aruba, Bonaire, Curacao). The cheapest flights are available from €399 for a round trip ticket. Consider to book charter flights to USA (Florida) available from €397. Note that fare is including all taxes except €15 booking fee. (Vary by each destination). Also there is no checked in luggage. You can purchase separately for extra fee. (Vary by chosen destination). TUI fly Netherlands promotion is in general available in May and June or September and October 2019. But also depends on chosen destination. Simply follow below link you like and compare there all available travel dates. In most of the cases you can book flight in main tourist destination. Booking samples (+ €15 fee per booking). Booking sample of TUI fly Netherlands promo sale: cheap flights Amsterdam to Africa €162 or Caribbean €399! In this case you would be heading to beautiful Cape Verde. You would book cheap flights from Amsterdam to Sal. Travel date sample outbound 11th of April and return from this African archipelago to The Netherlands on 18th of April 2019. 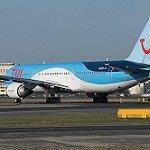 Do not miss this TUI fly Netherlands special promotion. Book the cheapest flights from Amsterdam to Africa, USA or Caribbean!